Our motor show is on again this year from March 28 to April 8. Once again it is going to be held at the Challenger Hall, Impact Arena, Muang Thong Thani and the organizers are promising a bigger, better show with plenty of new vehicle launches to whet your appetite. This is the second year of running at the Challenger Halls, and last year it showed that it was more than capable of holding the largest motor show in Thailand. The Grand Prix International Group, the organizers of the Bangkok International Motor Show realizes the significance of the show to the automotive industry which is trying to recover after having been badly affected by the tsunami in Japan and the floods in Thailand. Last year’s event was an overwhelming success in the history of the show. This year, exhibition space has been booked by BMW, Chevrolet, Ford, Honda, Hyundai, Isuzu, Kia, Lexus, Lotus, Mazda, Mercedes-Benz, MINI, Mitsubishi Motors, Mitsuoka, Nissan, Peugeot, Rolls-Royce, SsangYong, Suzuki, Thairung, Toyota, Volkswagen and Volvo. One exhibitor from last year which will not be present is Proton, while the parent company sorts out its financial situation, having been bought into by DRB in Malaysia. Mitsubishi Motor and Suzuki are expected to launch their eco-cars at the event, and Hyundai from Korea will launch their latest model, the Elantra. The motorcycle ranks will feature Big Bull, BMW, Ducati, Harley-Davidson, Honda, Kawasaki, Modern Bike, Stallions, Suzuki, UDA, Vespa and Yamaha. 2012 is set to be a great year for new bikes and the BIMS is where you’ll be able to throw a leg over the latest and greatest. From bling cruisers to the latest hi-tech sportsbikes, there’s something for everyone here. New are Ducati and Harley-Davidson. Organizers are also preparing a special area for visitors who want to do a test drive. Last year’s show featured 20 of the leading automotive brands and between them more than 1,000 test drives were taken during the event by enthusiastic show visitors. Other attractions for the general public include a music corner, automotive auction, photography competition, and a variety of automotive-themed talk shows. And yes, the “Pretties” yawn*. The Bangkok International Motor Show continues to show signs of healthy growth and popularity with a roster that promises not only to expand over last year’s 20 car companies but also to showcase top models. Concept cars and production cars from Japan, Europe, America, Korea and China are presenting technology right up to the future, signifying that the automotive industry of Thailand is still relevant in the automotive world of SE Asia as well as being important in the world stage. 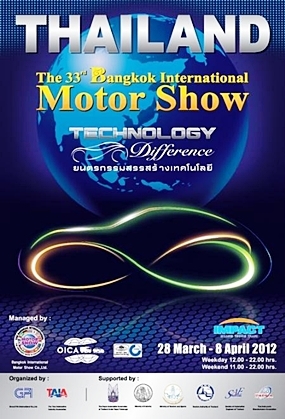 The BIMS runs from 28 March to 8 April 2012 at the Challenger Hall 1-3, Impact Muang Thong Thani – Thailand’s biggest automotive showcase. Round the world trip – on a Vespa?